Michigan's Every Avenue sat down with Alter The Press! prior to their main support slot with Hey Monday in London. The band spoke to Alter The Press! about their forthcoming album, 'Picture Perfect', being back in the UK, signing to Fearless Records, tour pranks with All Time Low and more. Every Avenue: It's been great. The shows have been awesome. It's our second time back and it's been ten times better since our last. We haven't really slept that much this time, we've been DIY'ing it and been sleeping in this little trailer van or people’s floors if we can. ATP: What have been your favorite pastimes whilst here? EA: Dennis loves Nando’s and getting snakebites. When we came in January, we were doing the same thing we’re really doing now but it was a lot colder. We hated everything last time. Because of that experience, we were not looking forward to coming back but it's been great, ten times better. It's really sunny too. Our booking agent took us to Reebok and got us all new shoes too. ATP: How did you guys end up signing to Fearless Records? EA: When we made our first EP, we put it on the website SmartPunk.com which Fearless Records semi-owns. We created a buzz there. When we wanted to put out our second EP, they said they wanted to do it. We built a good relationship and then they ended up signing us. It's been like that ever since. ATP: 'Picture Perfect,' the new album, is out in November. Is it finished? EA: It's done. We're sitting on the release date because we want to be on tour when it comes out and we want to do promotion before it comes out. ATP: What can we expect? EA: It's the next step, what everyone loved from the last album; it's more of that. It’s a hard question. People say it sounds like us but more mature. The best way to describe it is, it's an album that we'd listen to. When listening to the new album, it makes me think our last album sucked. We are really excited to get it out and play new songs live. EA: (David) Mind set, Tell Me I'm A Wreck. (Jimmie) A lot of my favorite songs didn't even make it on the album. ATP: Why didn't those songs make it to the album? EA: (Jimmie) Reasons beyond us. The label/management felt like it wasn't a good idea. ATP: Doesn't that faze you at all? EA: (Jimmie) It gets hard but we trust that our labels/management are acting in our best interest. It's nothing personal. It's just matter of opinion and even with the last album, there was a song called 'Freak Out'. They didn't like that song very much but whenever we play it live, it goes over the best. It's all preference. We hope those tracks see the light of day though, as b-sides or through iTunes etc. ATP: How would you compare 'Picture Perfect' to 'Shh. Just Go With It' (last album)? EA: Way better. We all feel it's a lot stronger, more dynamic; we take advantage of the slow and faster songs. We've been on tour since we put out the last album so we've been getting better as musicians too. ATP: Tracks from the last album were featured on MTV's ‘The Real World’ and ‘The Island.’ How did this happen? EA: Label. They are just like, 'Hey, watch The Real World tonight! They're going to play your song!' It's a pretty surreal feeling. ATP: One of you're tracks was featured as a download on Mark Hoppus' blog (bassist of Blink-182) as well? EA: I'm pretty sure he just came across it, or someone showed it to him. It's pretty cool. With that stuff, half the time we don't even know because we're on tour all the time. 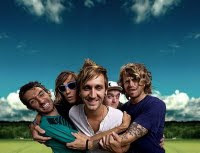 ATP: What’s this about an incident regarding you, All Time Low and their tour van? ATP: Has there been discussions of coming back? EA: Not really but we are going to talk about it. Every time we've done a UK tour, it's always been last minute. It's been about a month in advance that we've been told we’re doing a UK tour. With tours in the US, they say 'I think we might do this or that,’ depending on other tours. EA: We have nine days off and then start the US tour with The White Tie Affair, Stereo Skyline and Runner Runner. After that, we then have a short headlining run and then Christmas. 'Picture Perfect' is out November 2nd on Fearless Records.